Every year we travel to our favorite campground at the beach for some RV camping fun! 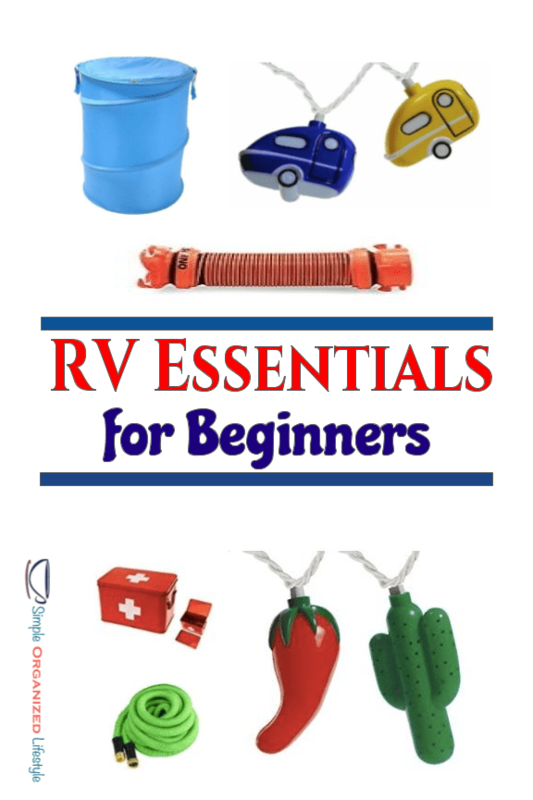 This is a camper essentials list I think first time travel trailer owners will find helpful. After taking RV vacations for the past ten years, we’ve definitely learned from our newbie RV camper mistakes! These are RV things (unless noted otherwise) that typically stay in the camper all of the time. It does not include the personal items to pack from home such as toiletries, clothing, bedding/towels and food. Congratulations! You just bought a travel trailer and are ready to go camping! 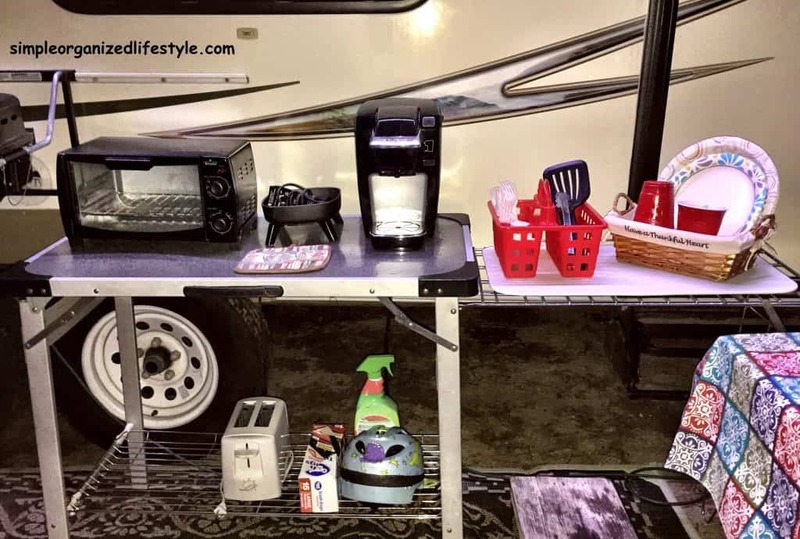 This is a weird thing about RV’s but, unless you buy a used one from someone who leaves it fully stocked and ready to roll, there are some necessities for RV camping that usually do not come with the camper. I have no idea why camper dealers do not offer a complete “ready to hook-up” RV for those who are new to RV camping, but most do not. Once you do purchase most of these camping necessities, you’re done! Unless something breaks or becomes damaged beyond repair, many camper essentials will last for the long haul. So, what things do you need for a camper? These would absolutely be on my first time rv camping checklist! To camp is to expect the best but prepare for the worst. You just never know what kind of emergencies might pop up when you’re traveling in an RV. Emergency toolkits are a must! One toolkit needs to hold common repair tools- hammer, pliers, screwdrivers, wrench, etc. (We just grab ours from the garage and put it in the truck.) Be sure to include some extra batteries of various sizes! Last, but not least, make sure you have a Safety/First Aid emergency kit. Most likely you have these items at home and can put them together in a small storage container to keep on hand in the RV. You wouldn’t believe how handy a dollar store pack of clothespins can be in an RV! They can be used to help with everything from drying clothes, closing chip bags, weighting down the tablecloth, to attaching curtains over a window when the kids are napping. When all else fails, duct tape can usually fix random RV issues, or help until it can be fixed. I’ve used it to attach a vent cover that kept falling off and to make a loop on a microwave door that kept getting stuck. It’s great to have on hand. I think you just need a regular flashlight for walking to the bath house at night or in case the power goes out. But I’m married to a guy who is obsessed with flashlights and asked him to give me the best recommendations in the $20-40 range for other flashlight/RV enthusiasts. Other campers are always asking us what kind of flashlights we have, so these can also serve as a gift idea for campers too! A lot of sand and dirt finds its way into an RV. A broom and dust pan helps keep it manageable. I like the smaller 3ft ones that have a place for a hook and don’t take up as much space. Working with sewage parts… gloves are an essential! So this movie scene is a bit dramatic, but things like this can definitely happen on a smaller scale. Wheel chocks are a must for safety before you unhook your vehicle to prevent the RV from shifting or rolling. They are simple to store under the RV. We got a set of solid rubber ones on Amazon for $15. They have worked out great! In addition to wheel chocks, you will want leveling blocks for your tires when you come across the campsite (you will) where stabilizing jacks are not enough. 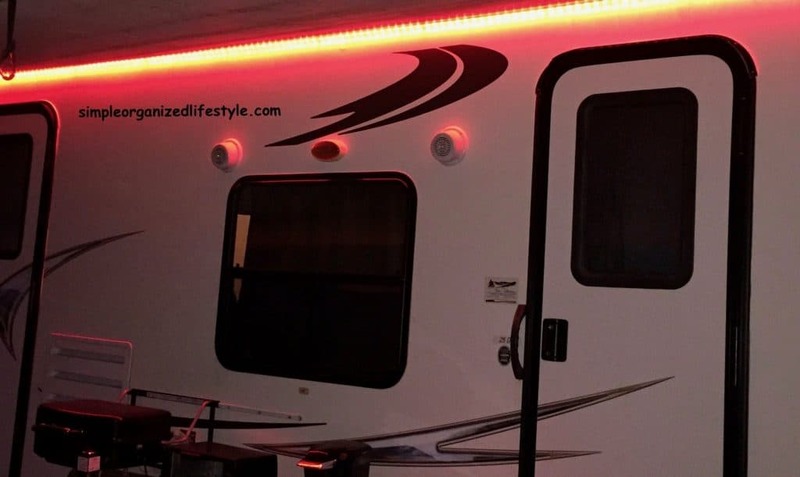 If you ever get into a situation where your RV power system is overloaded, an extension cord can help add to capacity for a toaster, coffee maker, etc. This will help avoid throwing a breaker. It’s also helpful for running lights (see “fun” below!) and using small appliances outside. On our last trip, we ran into the situation where the campground only had 30 amp service. It was an issue we had never had before, but thankfully the campground store had them in stock and the price was comparable to the same adapter on Amazon. Don’t buy new kitchen tools for an RV! This is a great opportunity to declutter your home kitchen or just ask friends/family if they have any of the following they would like to get rid of! Food storage supplies- aluminum foil, storage bowls, etc. Grill (our RV came with a small one that attaches to the side) We bought a Coleman Sportster Grill for our in-laws for Christmas a few years ago and it’s been great too! One of the best perks about an RV is being able to go to the bathroom in the middle of the night just a few feet from where you sleep. The down side to that? You need all the pieces to make sure the sh*t stuff goes where it needs to go. I don’t think we’ve ever had to stretch the hose more than 10 ft, but you may end up in a campground with some kind of odd design and need more than 10 ft of hose. This keeps your sewage hose off of the ground and helps with the flow as well as working with a site that’s not level. For the water hook-up, you need a special hose for the drinking water, a water filter (newer RVs may have this already), a water pressure regulator and a hose connector. I almost put this in essentials because we love it so much, but just a personal preference! It hangs on the back of our camper (shown in photo below) and we use it for everything from washing off our kid to cleaning grill parts and more. We love the pocket hose because it’s light and never gets tangled up. We have the “As Seen on TV” hose but it was a lot cheaper at one of our local discount stores. The reviews are not that great for these, but it makes me wonder if it’s well suited for RV needs but not typical home & garden uses. These pop-up trashcans are awesome for keeping trash out of the RV yet being able to zip it up to avoid attracting insects. Best part- it’s collapsible and doesn’t take up much room! Hint: RV supply places may sell this as a trashcan but you can find it much cheaper as it’s other purpose… a hamper! 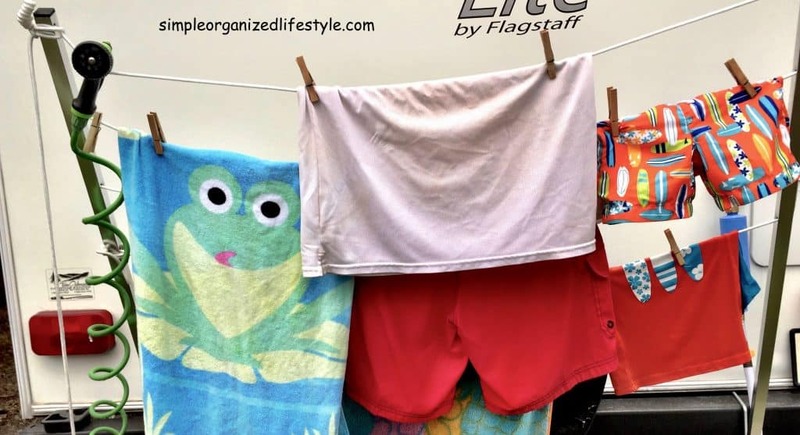 Many RV campgrounds have rules about not having clothes lines or rules about where you can or cannot hang wet clothes. However, we have never had an issue by using an extendable clothes rack that attaches to the back of our RV. Not an essential, but definitely helpful! We had the table in the image above for ten years until it finally bowed up and became damaged beyond repair. We wanted another one just like it but they no longer make it so we took a chance on this table to hold our small grill, coffee maker and cooking tools. So far (a few trips in) it’s working out great! Helpful if you end up on a space with a lot of dirt. Ours was given to us with our first RV but my in-laws had to buy one recently and they got it at Wal-mart for $20 in the auto/RV section. Camper mattresses are not much better than the board underneath them. The cheapest solution to getting better rest is to add a foam memory topper. Just keep in mind that camper mattresses are not the same size as regular mattresses so it’s possible a topper may have to be cut to make it work. The night activities are part of the fun and lights are fun! 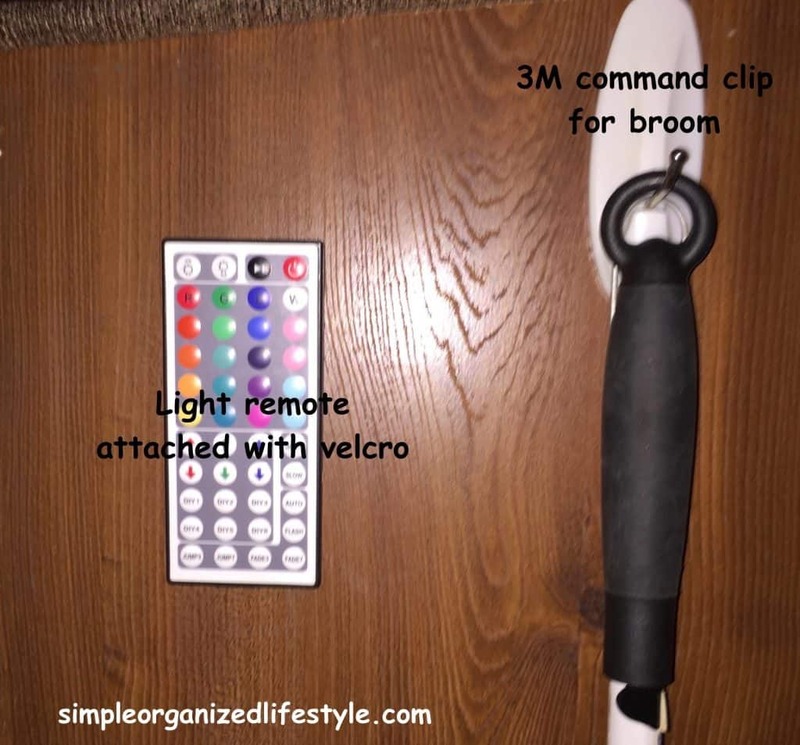 Find some lights that represent your family’s personality :] Ours are an attached LED light strip with remote. This game has become a hit at most campgrounds. 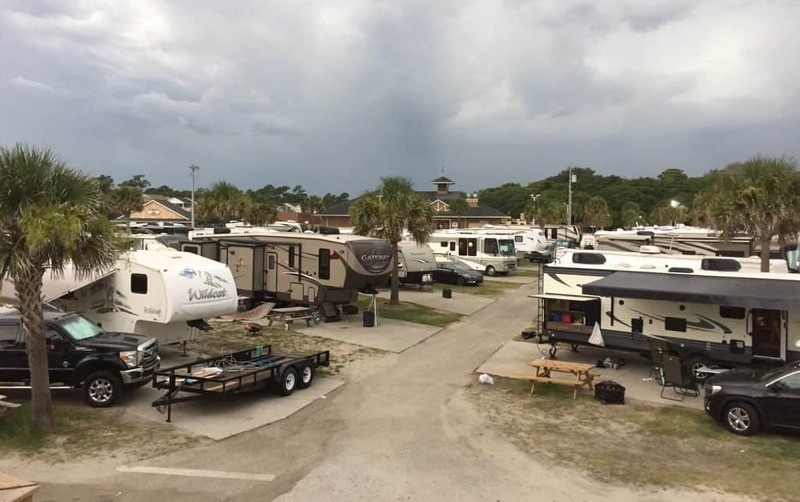 A lot of campgrounds organize team tournaments for campers of all ages. We have the regular typical “Father’s Day gift” fold out travel chairs, which are great since they easily fold and travel in a bag. But my in-laws scored some cool black bungee chairs at last year’s Black Friday sale at Home Depot. I’m hoping we can find these at this price again this year for our back porch! Because they are just fun! When we spent last Halloween in the RV, these were our choice for trick or treating treats and the kids loved them! Because… so many special RV trip memories are made around the campfire! If you’re also an RV camping enthusiast, please tell me what you would add to the list! Happy camping! 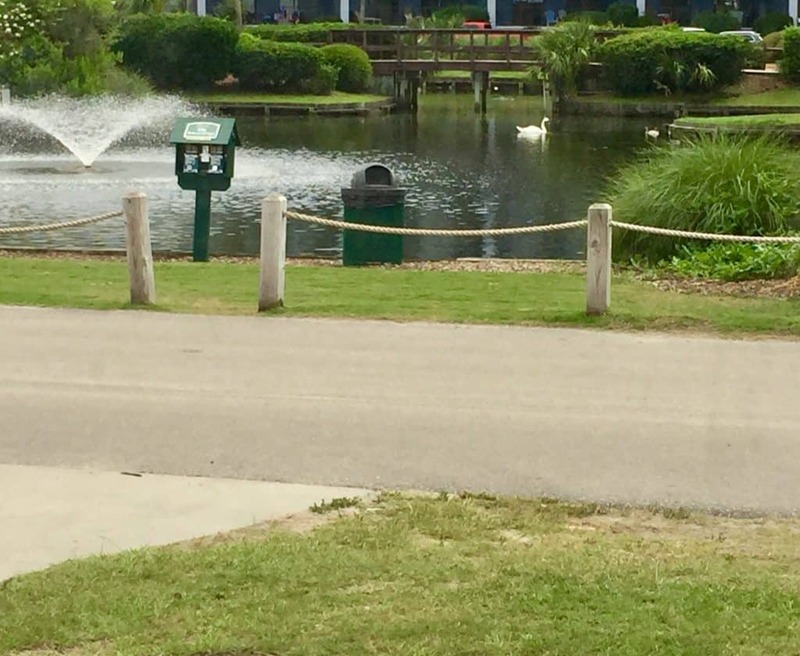 That duck pond and OceanLakes is my favorite campground too! Have you ever been during the Halloween Weekends? They are so much fun! Just bought our very own camper, even though my family has camped in a RV my whole life, I still need tips for my own! Great info! These are great! As we get a little more serious about getting a camper we will keep these in mind. We have been tenting it the last 5 years. Now with a little one it makes sense to get a camper. Thanks for sharing. We tent camped once when our son was 6 months old- the air mattress kept deflating and we had a rain leak- he had a blast, but a camper definitely makes it easier! Glad the list was helpful, thanks! Love this post. And I agree with everything you said. It’s neat you have a Flagstaff camper as that is what we have too! I’m so glad you thought it was a complete list- you would know for sure:] Thanks so much Julia!